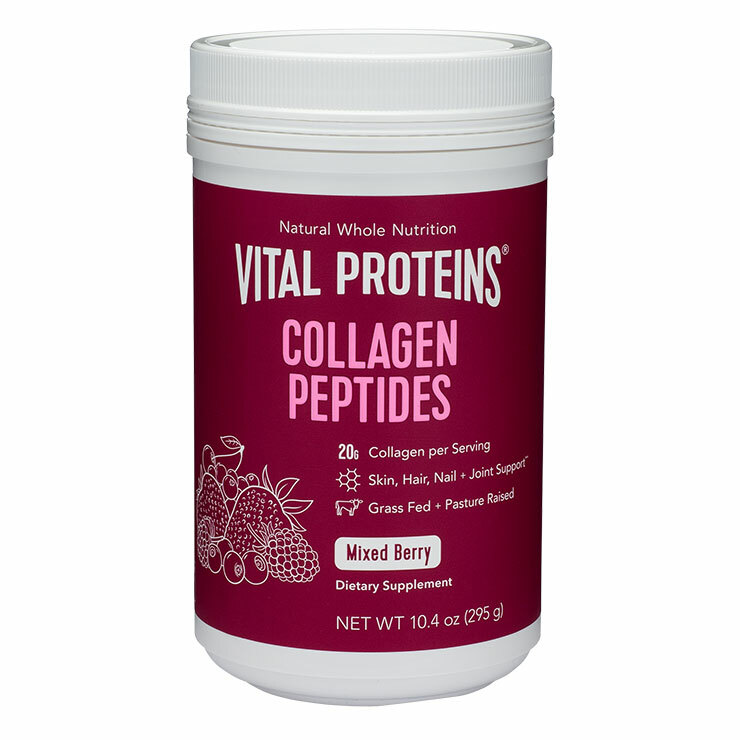 For a fruity flavored collagen boost, make Vital Proteins Mixed Berry Collagen Peptides a part of your daily routine. Organic blueberry, strawberry, blackberry, and cherry have been added to collagen sourced from grass-fed, pasture-raised bovine to beautify skin, hair, and nails, and improve the feeling of joint and bone health. Hyaluronic acid improves the appearance of hydration and glowing skin, while probiotics support a feeling of gut health. Easy to use, simply add the flavored collagen powder to your favorite beverage, to smoothies for a protein boost, or mix into hot cereal or yogurt. 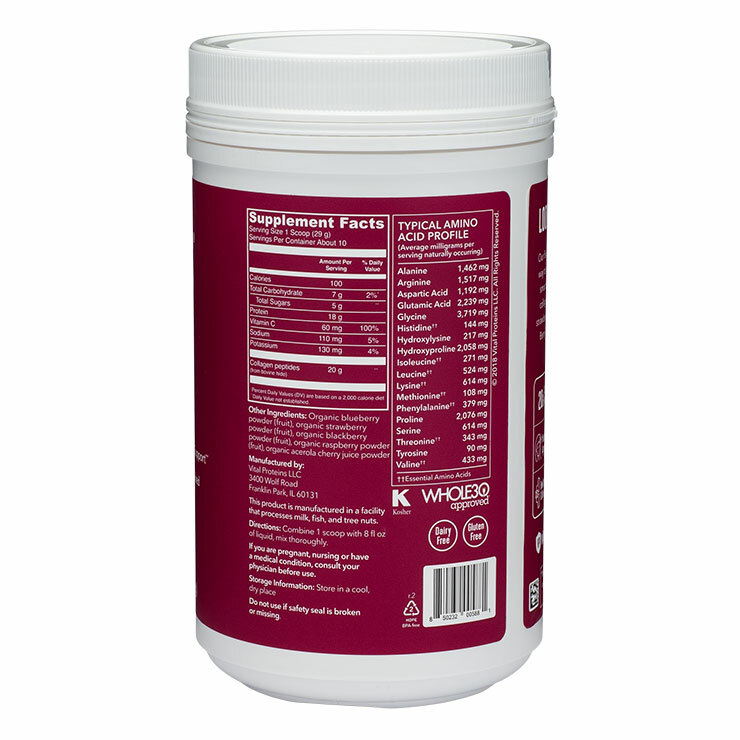 Perfect for paleo and Whole30 diets, this product is gluten-, dairy-, and sugar-free, and is easily dissolvable. 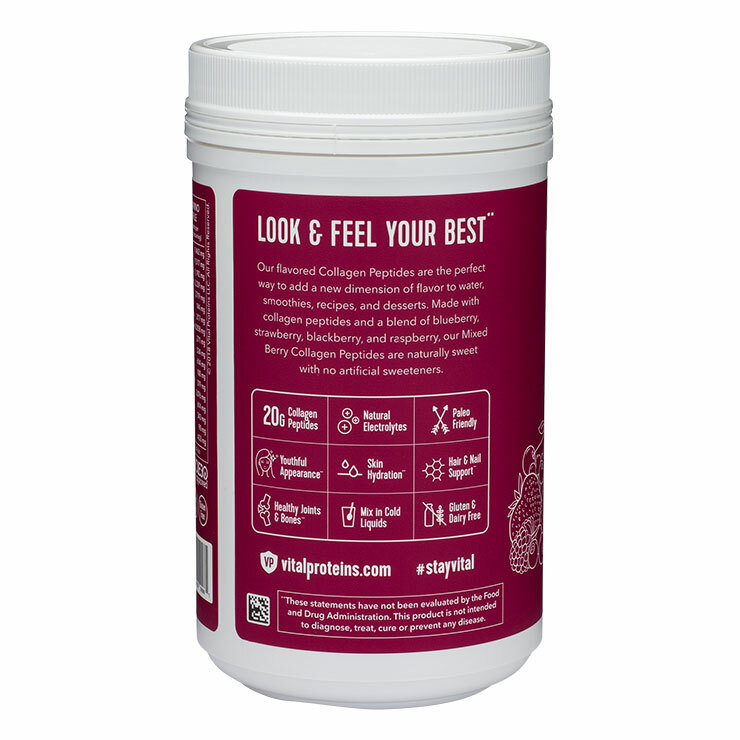 Add one to two scoops of Mixed Berry Collagen Peptides to cold and hot drinks, smoothies, hot cereals or yogurt. Use daily to beautify skin, hair, and nails, and support a feeling of overall health and well-being. Kept my skin in tip top shape for the month+ that I drank with water everyday - more so than any topical product. I've been having hormonal acne on my chin this past year and this as the only time I had 0! My only bone to pick is that for some reason, Vital Proteins consistently uses packaging that is twice as large as the amount of product. For example, this container looked to be half full and then the Beauty Boost Vitamins container was also half full. Yes - the info for the amount of product is on the packaging but who knows what that looks like! I would suggest the make their packaging smaller so the consumer doesn't expect to see a full container and get a bit of a let down when they open the container. Otherwise, great product!